This is the climactic stage for information you will receive on the Internet prior to the actual fabrication and fitting of the impression moulded plastic ocular prosthesis. The web site will now transfer you or your child via the Contact Us to meet with the Jahrling team of ocularists. You should have your itinerary planned as to the mode of transportation to our office, any arrangement for an overnight stay (if necessary, for out-of-state or out-of-country) and the appointment dates for the required three sessions. In order to allay any fears, anxiety or uneasiness caused by this upcoming new experience, we will explain the process in a detailed step by step fashion. At the reception desk, you will be escorted into one of the fitting room to meet your team of ocularists. Review: History (Hx) and Diagnosis (Dx) that lead to the eye loss. Internal Evaluation: The cavity will be checked for depth of the culs-de-sac (to hold the prosthesis). The condition of the conjunctiva to see if there is any adhesions (scar bands) or dehiscence (tears in the tissue), and to study the eye muscle/implant response to companion eye movement. Hands-on: Impression moulding of the cavity begins with a verbal and visual description of the impression moulding technique and what it entails. 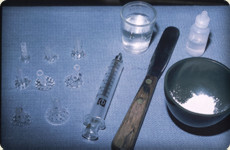 The paraphernalia consists of a series of fenestrated impression acrylic trays with projecting hollow stems, a 10cc syringe (no needles), alginate impression material, distilled water, mixing bowl and spatula. 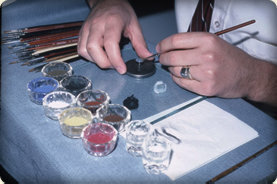 The impression process begins with a selected acrylic tray that is inserted under the eyelids (that will fit without creating any distortion of the lower cul-de-sac), and held in position by the stem. The alginate and water is mixed and placed into the syringe for easy injection into the impression tray. (It has a cool sensation when the flow fills the cavity.) The mixture sets within two minutes and the entire tray and impression is removed. A plaster mold is made of the impression to form a replica of the cavity. At this stage, hot wax is poured into the plaster mold to duplicate the flush fit of the alginate impression. The trial fitting of the wax model will then give indication of any adjustments and modifications necessary to attain symmetrical anterior projection of the companion eye and alignment of the eyelids. Its catoptric image is then marked for pupil-center with a plastic stem (the same type stem that is on the apex of the plastic iris-cornea button). While the working wax model is being trial fitted (at our Boston office) the second ocularist will be doing the iris color painting to match the fellow eye. The following detailed description will give a complete insight on this process. The art of iris color duplication begins by first observing the depth of the anterior chamber and the curvature of the cornea. These are keys to obtaining a three dimensional lifelike effect of the painted iris. It also helps in selecting a proper pupil size for the flat acrylic iris disc. Materials used in the fabrication of the prosthesis must be compatible with the medical/dental grade PMMA (polymethylmethacrylate). Iris color pigments selected are only those finely ground dry colors that have been checked for their chemical and physical properties for permanence and stability, thereby, eliminating any chance of color fading or delamination when incorporated with a suspension of monomer-polymer liquid mixture. This acrylic mixture for blending the dry iris pigments, however, does emit an odor, which requires an exhaust system near the palette. Controlled light source is utilized for ideal color matching. Natural daylight is a variable (time of day and atmospheric conditions) and it will effect the color matching of the human iris and its scleral tints. Because of this, all color matching is done under a specially manufactured artificial fluorescent lighting that has a color spectrum of north sky daylight (7,500 Kelvin). In addition to this controlled light source, all natural and standard fluorescent and incandescent lighting are blocked out. The surrounding walls are a flat matte gray to eliminate color reflections. Upon completion of the flat iris disc painting, it is placed in an iris-cornea die plate for a polymerization cycle to obtain a clear acrylic cornea (with an attached stem at its apex). This will then be incorporated with white plastic material in a two piece dental stone mold made from the prosthetic wax model. The next laboratory session entails the simulation of the scleral tints and vascular pattern (white portion of the eye). This is accomplished by first exposing the embedded iris-cornea surface to the desired iris diameter. Red nylon and cotton threads are applied in varying thickness to create the 'bloodshot' appearance. This is followed by painting on various tints to simulate the scleral tones. Upon completion, this phase will require a clear acrylic overlay (which replaces the amount of white acrylic that was removed to expose the iris) under a controlled heat and pressure curing cycle. We will then schedule a follow-up session for 4 to 6 weeks later to check for comfort, fit and cosmesis. It is advisable to make notes of any questions you need answered, or any wearing problems you may have experienced in the interim.